The Congress Working Committee will be chaired by Sonia Gandhi at her residence today. Congress president Sonia Gandhi will chair the Congress Working Committee meeting. 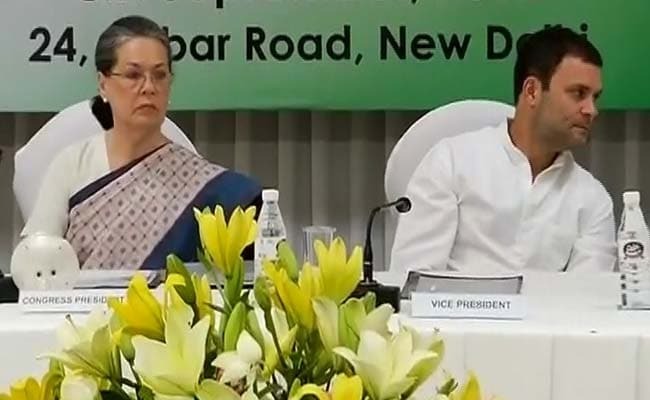 New Delhi: The Congress Working Committee, the highest decision-making body of the party, would meet on Tuesday where it is likely to discuss the current political situation in the country and the issue of forging a larger opposition unity. Congress president Sonia Gandhi will chair the meeting which will be held at her residence. She had skipped the last meeting which was chaired by Rahul Gandhi. Meeting after a gap of seven months, senior members of the CWC are likely to discuss the raging issue of cow vigilantism and also the declining economic condition, party sources said. They said the CWC is expected to ratify the schedule for organisational polls. According to the schedule, the next Congress president has to be elected by October 15. The CWC is meeting at a time when the Congress is seeking to unite opposition parties ahead of the presidential election. It wants a broad coalition of opposition parties in place ahead of the 2019 Lok Sabha elections to take on the BJP. The BJP and its allies have gained in strength since the Modi government was formed in May 2014. The CWC members had in November unanimously expressed "strong sentiment" for Mr Gandhi's elevation for the first time and may take it further. At the November-7 meeting, all members, including former prime minister Manmohan Singh and senior leader A K Antony, had made a strong pitch for Mr Gandhi to take over the reins of the party. The Congress president has created a record by being at the helm of the 130-year-old organisation for nearly two decades since late Sitaram Kesri's ouster by the CWC in early 1998. Mr Gandhi was appointed party vice president in January 2013 at Congress's brainstorming session in Jaipur.